Sea fisheries are on the brink of collapse and oceanic Sharks face extinction - but there's a ray of hope, and that is the impact of Marine Protected Areas. But the extent of protection is not the only issue, according to Carl Gustaf Lundin, head of the global marine program at IUCN, the World Conservation Union. "The benefits of marine-protected areas are quite clear in a few cases; there's no doubt that protecting areas leads to a lot more fish and larger fish, and less vulnerability. But you also have to have good management of marine parks and good management of fisheries. Clearly, fishing should not wreck the ecosystem, bottom trawling being a good example of something which does wreck the ecosystem.This is a good compelling case; we should protect biodiversity, and it does pay off even in simple monetary terms through fisheries yield." Case in Point: Shark Reef Marine Reserve. The species count has increased dramatically from our baseline study in 2004 yielding 269 species, to January's count of 381. And this isn't the end of the line, as according to the scientists, "further research is required at SRMR to fully assess the faunal diversity. The fish survey of SRMR is not yet at the point of diminishing returns. On their last dive the observers recorded 5 additional species. The shallow reef habitat appeared healthier in 2008 than in 2004. Coral growth was prolific in areas previously barren. Easily observed species associated with coral, including the coral-feeding butterflyfishes Chaetodon trifascialis, C. ornatissimus, C. melannotus and C. lineolatus, were recorded in 2008, but not observed in 2004. A prolific and healthy reef supports more species. The health of the SRMR reef may be the result of four years of good stewardship. Considering the constraints of observer time and survey methods utilized, the 381 fish species recorded during a brief window of time in a limited area is a impressive number and indicative of a rich and diverse fish fauna. The shark population at SRMR would appear to be supported by a solid foundation at lower trophic levels." The according increase in Shark numbers has been nothing short of miraculous. 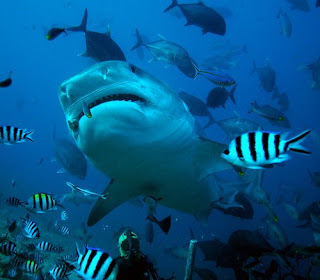 When we started in 2004, seeing a dozen Bull Sharks on a single dive would have been exceptional. Now, we would be kind of disappointed if we didn't see double that number. We've now named and are keeping track of 35 individuals and on a recent dive in April, almost all of them turned up along with maybe a dozen more perfect, and thus "un-nameable" friends. Yes, I'm talking 40+ Bull Sharks, on a single dive and in perfect visibility! What a sight! We all hung back in sheer disbelief and just enjoyed the show as even Rusi just couldn't keep up with the demand anymore. And in the middle of the stampede, there comes Scarface - only to be taught that size matters, but numbers are better! Normally, she would just glide in majestically, do a leisurely round to flaunt her importance and then proceed to dominate the hand feed as the Bulls beat a strategical retreat. Every time she would try to approach, the Bulls would unceremoniously barge in ahead of her, or even physically push her out of the way. Ever seen a flustered 5 meter Tiger Shark? Very funny indeed! Finally, she decided to change gears, rush in for a fast nibble and get the hell outta there. But no worries, she's been back since. This is the time of the year when we welcome most of our VIP groups along with yet more film teams, researchers and photographers. The list would be too long to mention but Lawrence of Shark Diving International always gets to meet his favorite lady and this time has been no exception. She's truly a poser and always knows when to make an appearance - this time alongside Brat, the Tiger named by Broadreach Academic Treks. Drop us a line and join us for the experience of a lifetime - and make a valuable contribution to Marine Conservation!